My middle child has been obsessed with owls lately, so of course she wanted to be one for Halloween. 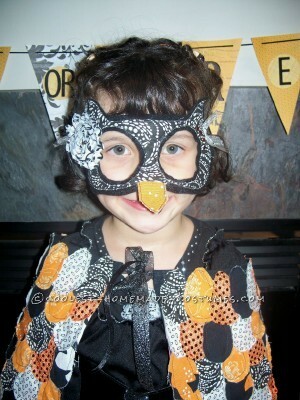 Owl costumes are not too hard to find for little kids, but I wanted her to look unique and a little glamorous. 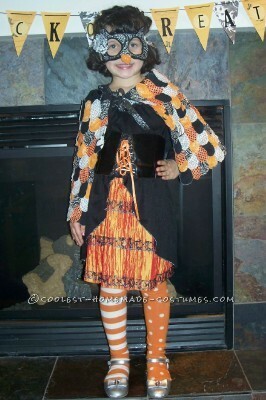 I already had a dress that went to a witch costume that had been handed down from my cousin when her daughter outgrew it, and it fit my daughter perfectly. I liked the fake corset on the front and the orange fabric at the bottom, and I thought to myself that this would make the perfect dress for her owl costume. What was missing were the elements that would make her look like an owl, so that’s where I could use my creativity. I looked at some blogs and got some really good ideas off of two different ones. I decided that I would work off of their ideas to make an owl cape, and also used a free online pattern to make the mask. 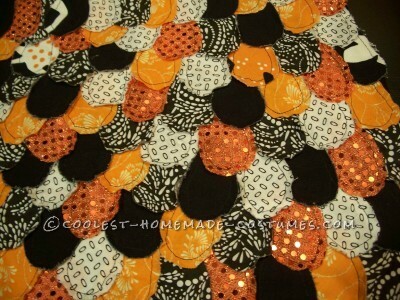 I headed to my favorite craft and fabric store, Joann, taking advantage of a 40% off sale on their fat quarters and used a coupon on a yard of some glittery orange fabric. I spent less than $5 on the fabric, some glittery black ribbon, and one piece of black felt. I also used a remnant of some sturdy black fabric that I bought at IKEA a few years ago for solid black feathers and for the inside base of the cape. After spending a few hours cutting out teardrop shapes for the “feathers” out of the fabric I had and bought, I began the tedious work of sewing each feather on to the cape. Don’t get me wrong, I enjoy sewing, but this took FOREVER. 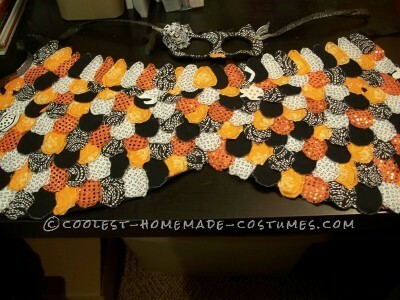 It took about 45-60 minutes to sew each individual row of “feathers” on this cape. But it was worth it! My advice if any one reading this wants to make this kind of costume: don’t wait until the last minute. This costume took me about 2 weeks to make. I made the mask out of the black felt and one of the fabrics I bought, stitching them together, and added some feathers, adhesive jewels, ribbon, and a shabby chic damask print flower that I already had. 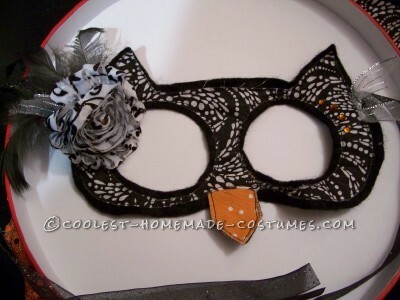 I used the glittery ribbon for ties for the mask, and also ties for the cape. I sewed another damask print flower on the black long sleeve shirt that my daughter was going to wear under the dress. Halloween is usually a little chilly in our part of town, and the neckline of the dress was low enough to show off the flower on the shirt underneath. She wore some silver dress shoes that she already had. The most expensive part of the costume was some adorable mismatched tights from Gymboree, and they were only $10. Although I can’t take credit for the ideas of this costume, I am very proud of how it turned out. The cape is very durable and will only look better with time as my daughter uses it for dress-up play.